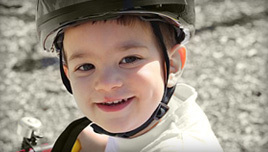 The Aidan Manning Memorial Foundation is dedicated to advancing research and treatment of childhood medulloblastoma, while providing children with the most sophisticated treatments available. The Aidan Manning Memorial Foundation is a 501(c)(3) tax-exempt public charity and donations are tax deductible to the greatest extent allowed by law. Brain tumors are the deadliest form of cancer in children and are fatal for almost half of the children diagnosed in the U.S. every year. “How quietly he tiptoed into our world. Aidan was diagnosed with Medulloblastoma, a malignant brain tumor, on December 19, 2009 after a very brief illness. He endured multiple surgeries and five rounds of high dose chemotherapy. Our sweet, very brave boy lost his battle and went to heaven on July 30, 2010. He was 3 years old. Read more about Aidan. Although Aidan did not get the chance to live a long life, his courage, bravery and strength continue to inspire us everyday.